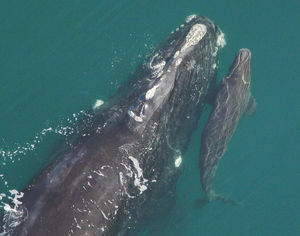 The calls of North Atlantic right whales change as they get older, according to a new study. In a study published in Animal Behaviour, scientists examined 986 high-quality calls from 49 individual North Atlantic right whales of known ages spanning from one month to 37 years. These were collected during 1999 to 2016 in the Bay of Fundy, Cape Cod Bay, and off the southeastern U.S. coast. The calls made by whales less than a year old were shorter and less structured. Then, as they matured, their calls became clearer, with better defined structure and longer call durations. This pattern is similar to that of humans and other mammals. This acoustic maturation continues to develop even after the right whales reaches sexual maturity (at age nine for females, and at age 15 for males). "The calls continue to develop as the animal ages, decades after it is physically mature. The frequency and duration of these calls may be able to tell us about body weight and size, and physical condition, including stamina,” said co-author Sofie Van Parijs, leader of the passive acoustic program at NOAA's Northeast Fisheries Science Center (NEFSC) laboratory in Woods Hole, Mass. In the study, the most noticeable changes in the whale calls occurred between the first and second years of life. When they were less than a year old, the calves made highly distinctive and chaotic calls. By their second year, although the calls were still short and chaotic, they more closely resembled adult calls. Then, from ages 2 and 8, the whale calls exhibited less chaos and increased control over the sounds, possibly showing a need to distinguish between individual animals. Right whales also show flexibility in sound production, as they respond to changes in background noise by modifying their frequency and call amplitude in noisy environments.